uploaded 111 House through Add A Home. 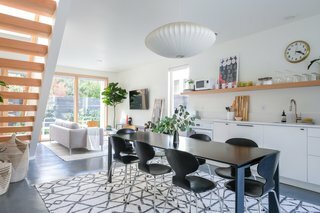 The 111 House is designed to be open, bright and modern. With an open floor plan it's great for relaxing, socializing or using as a home base as you explore Portland, Oregon. Front of the 111 House with keyless entry for easy coming and going! Front entrance and private back patio - the perks of renting an entire house! The open staircase brightens the space and makes it feel spacious and beautiful. View from front to back of house. View from back to front of house. The kitchen was designed to blend with the open floor plan. The SMEG refrigerator was chosen to feel like a piece of furniture and many of the household items add a sculptural quality. 111 House kitchen. Heart coffee is only 2 blocks so it's easy to buy beans or just have them make your coffee for you! The cozy living room has Netflix ready for you to binge your favorite series. The house is stocked with local books, guides, zines and publications helping guests learn more about Portland and the surrounding areas and plan outings. A view of the back patio from the living room, designed to be an extension of the interior space. The bathroom is bright, clean and beautiful - everything you want a bathroom to be. This bedroom has a king bed, blackout shades and a white noise machine for the lightest of sleepers to relax. The second bedroom has a queen bed and private deck to enjoy. The wall of windows and private deck extend this bedroom beyond the walls and has the best sunset views in the house. The huge skylight in the bathroom floods the space with light. It's great when planning what to wear while looking up at the morning sky for weather too. The second bedroom has art and accessories from local Portland shops Schoolhouse Electric and Sitte Modern.